The U.S. Census Bureau today released the first-ever report examining the prevalence of non-degree certifications and licenses among American adults and their importance to the employment market. The report found that alternative credentials provide a path to higher earnings, underscoring that traditional educational attainment is just one way for workers to attain the skills needed in today’s global economy. A skilled workforce is an essential part of a modern, innovative economy. However, many U.S. employers today are struggling to find workers with the skills to fill some of the 3.9 million open jobs. That is why, for the first time, the Commerce Department is focusing on skills training as part of its Open for Business Agenda. 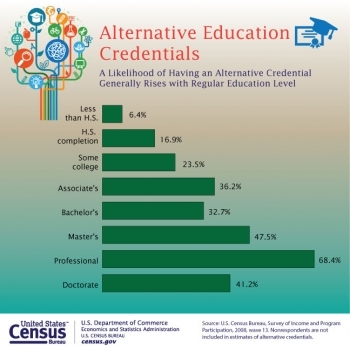 The report, Measuring Alternative Educational Credentials, found that in fall 2012, 50 million U.S. adults, or one in four, had obtained a professional certification, license or educational certificate apart from a postsecondary degree awarded by colleges and universities. 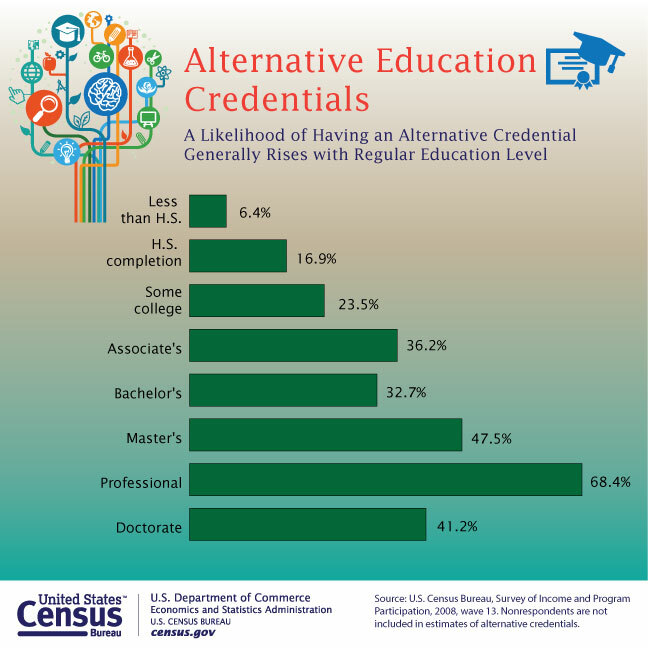 The report shows that, in general, these alternative credentials provide a path to higher earnings. Among full-time workers, the median monthly earnings for someone with a professional certification or license only was $4,167, compared with $3,433 for one with an educational certificate only; $3,920 for those with both types of credentials; and $3,110 for people without any alternative credential. This report makes it clear that Americans who pursue non-traditional education have the opportunity to obtain get good-paying jobs in emerging fields. Among the adults included in the report, 12 million had both a professional certification or license and an educational certificate; 34 million had only a professional certification or license; and 7 million had only an educational certificate.